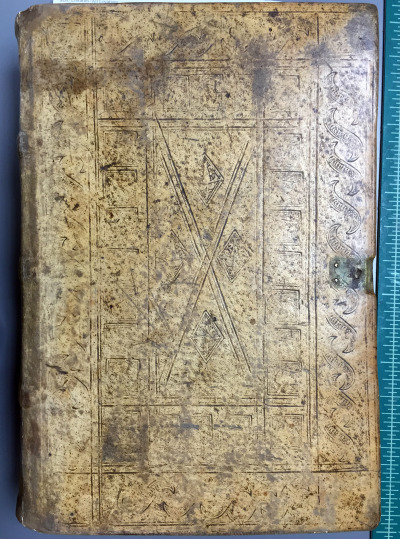 If you’re in the habit of reading descriptions of old books—and why wouldn’t you be?—you’ve likely come across something described as bound in period style or in a sympathetic binding. This typically means the book was rebound relatively recently, but rebound in a style consistent with the time period of the book’s original publication. For example, our first edition of the Meditationes Vitae Christi (Meditations on the Life of Christ) was rebound in such a way. You can read more about this work—a recent acquistion—here. 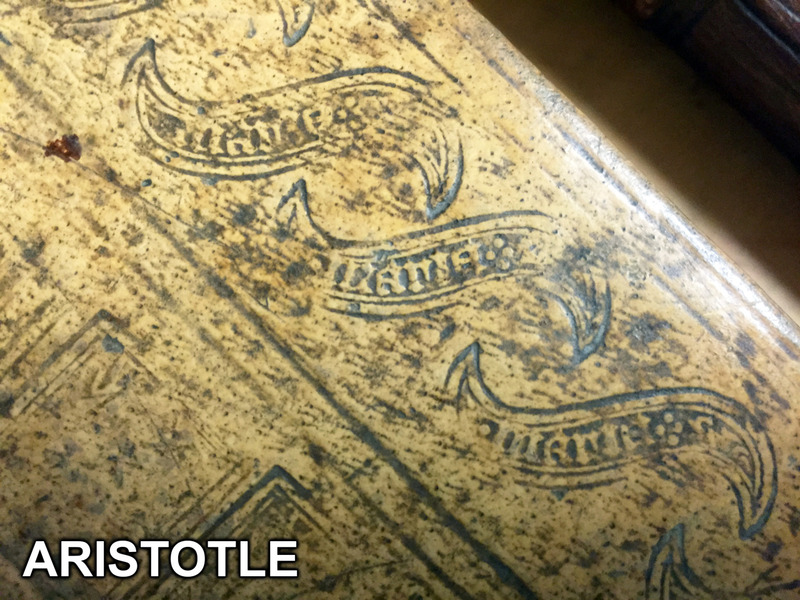 And shortly after the Meditations arrived, we received the first printed Greek edition of Aristotle (it was a very good summer), which underscored just how well done this period-style binding was. Although the books were likely bound about 400 years apart—the Aristotle around 1500 and the Meditations around 1900—the styles are strikingly similar. The combination of borders built up from different tools, surrounding a central diaper pattern, was a familiar style when both were published. 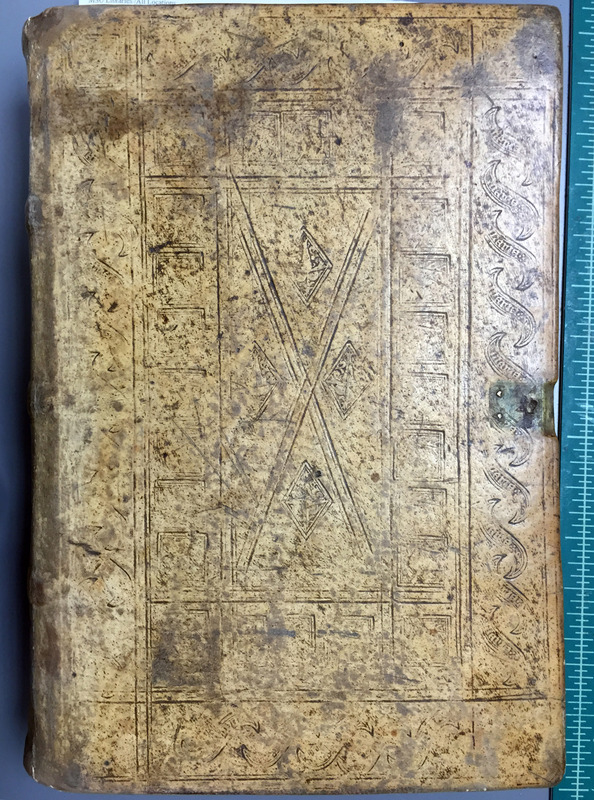 The Aristotle binding is almost certainly German, so it’s no surprise that the binding of the Meditations, which was printed in Augsburg in 1468, emulates a 15th-century German style. Of all the similarities, what most caught our eyes was a particular tool used to decorate the boards. While obviously similar, small differences distinguish them. 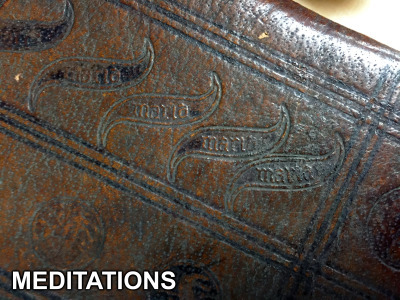 The Aristotle version, for example, has four tiny dots following Maria, while the Meditations version has no dots; a double border surrounds the Aristotle tool—thick on the outside, thin on the inside—while the Meditations tool has a single border; the Aristotle tool measures over 3 cm from end to end, while the Meditations tool measures just under 3 cm. The sheer volume of such tiny differences among tools is staggering. 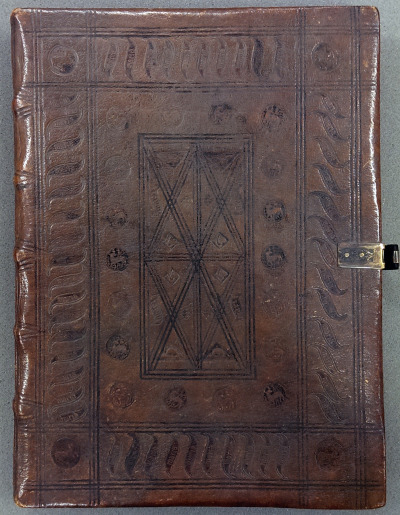 The Einbanddatenbank, a database of 15th- and 16th-century finishing tools used on German bindings, records more than 600 versions of the Maria tool. How do we know the Meditations binding isn’t original? There are a number of clues, the general as-new appearance being a big one, but subtler evidence is there. The spine edges of wooden boards were commonly beveled in the late 15th century, but they aren’t here. Spines were seldom decorated at this time, yet the binder of the Meditations couldn’t help but to add some restrained decoration. Could these features be found on bindings from the late 15th century? Sure. But the accumulated weight of the evidence favors something done later in period style. Make no mistake, the Meditations binder was good. Even the endpapers are period-appropriate leaves removed from an old book. 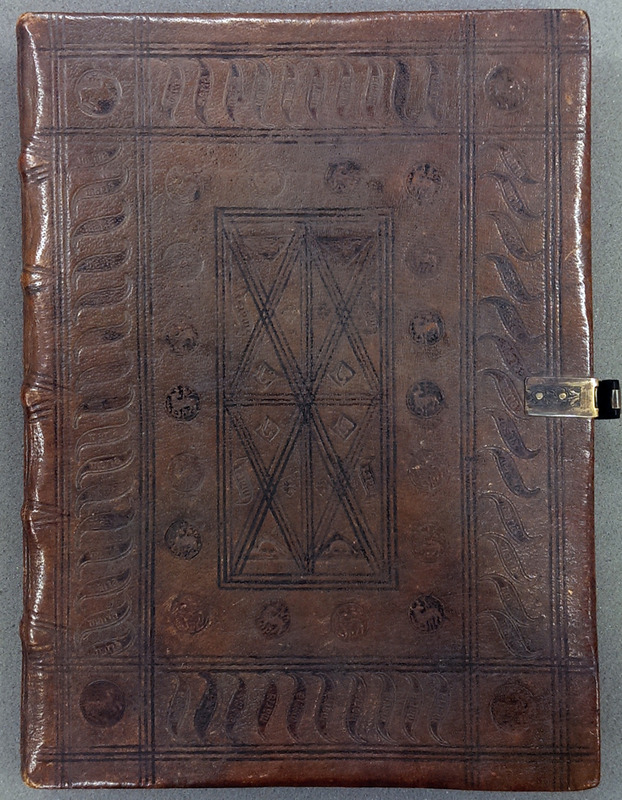 This binding was absolutely the product of a skilled craftsperson with a thorough understanding of period styles—and perhaps the product of a binder with the skill and patience to make their own finishing tools. Patrick Olson, Rare Books Librarian at MSU Special Collections. Patrick joined Michigan State University in 2014, having previously held special collections positions at the University of Iowa, MIT, and the University of Illinois, where he also earned his MLIS. Prior to becoming a librarian, he spent four years working in the rare book trade.